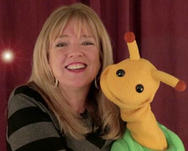 Creator Lesley Smith, has inspired over a million children in loving choices as a National Foundation for the Arts touring artist beginning in 1994. A world class ventriloquist, puppeteer and musician, Lesley and Sammy continue to teach solutions for difficult problems (bully and violence prevention, nutrition and environmental education). Sammy's New World is a heart-based children's entertainment brand. The mission is to entertain while empowering children and their families to create a more peaceful world through love and respect of oneself, each other and the living earth. "Sammy" is entertainment first and foremost, starring a funny "do-gooder" of a snail. Sammy’s New World is a high production digital experiences to be delivered globally through an innovative platform. The Sammy real-world experience will be expanded through live interviews, performances and appearances on the world-wide circuit with our partner organizations as an entertaining "spokeschild" for a loving and peaceful world. 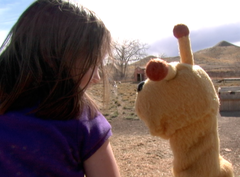 Super heart-powered Sammy travels the country from elementary school assemblies in Santa Barbara CA to middle-school assemblies in Whiteville, South Carolina; and from the Apache Nation preschoolers in Arizona to a Puppet Pajama Party in Newburyport MA. Whether Sammy is in hospitals, schools or theaters the message is the still the same "it's how love grows".